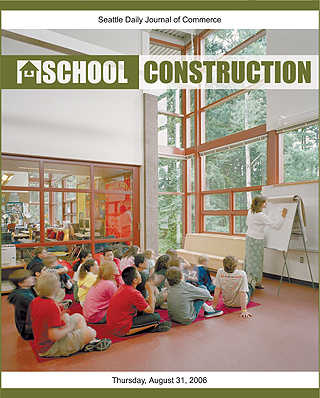 "Schools losing out as construction costs soar"
"Flexible classrooms are a perfect fit"
"Careful builders can avoid contract disputes"
"Does your school building make the grade?" Benjamin Franklin Elementary School in Kirkland, designed by Mahlum Architects, was completed in 2005 for $9.8 million. Spee West Construction was the general contractor. Project team members also include Cascade Design Collaborative, Coughlin Porter Lundeen, Keen Engineers and Coffman Engineers. "Getting around permitting hurdles takes creativity, teamwork"
"Gateway opens up a closed-off campus"
"State beefing up health and safety requirements"
"Rain gardens: effective, natural and cheap"
"Partnerships a high note for school, community"